Although the Labouchere system is named after Henry du Pre Labouchere (1831–1912), an English journalist and Member of Parliament, Labouchere gave credit for the system to Condorcet (1743–1794). Condorcet, a political leader during the time of the French revolution, was interested in applying probability theories to economics and politics. The principle behind the Labouchere system is that you can create winning sessions even if you win less than 50% of the time. The system achieves this by changing the bet sizes to cover prior betting losses. While the Labouchere System looks complicated at first, it is rather easy to use once you try it once or twice. The Labouchere system uses a series of numbers in a line to decide the amount of your bet. You can choose any series of numbers and they can vary in length, e.g., 1-1-1-1, 1-2-3-4-5, etc. These numbers represent betting units. The sum of the two outside numbers is the amount for the next bet. If you win you cross out the two outside numbers and proceed to use the shorter line. If you lose, you add the amount just wagered to the end of the line and continue to use the longer line. The value of the first bet placed is calculated by adding together the sum of the first and last numbers in the line (the outside numbers). For baseball we find that the ideal unit size to be 1. If you use larger unit sizes, the bet sizes will become quite large after a few losses and possibly go outside your comfort zone. In addition, to allow you the ability to clear the line as quickly as possible, we find the right length of line to be 4 units. If you win Game 2, you cancel the line and start a new one. You continue this process until the line is cancelled and you are showing a profit for the line. Note: Always bet "to win" the total of the two outside numbers. The Labouchere System is very popular with casino players but the truth is no system can help you win casino games such as roulette. A computer cannot consistently and accurately predict the outcome of a roulette spin because it is not a game with a reoccurring pattern. It is a random game of chance. However this is not the case in baseball. Baseball is not played with dice or spinning wheels; it is played by human beings who hate to lose. Thus, if the NY Yankees lose today, they are even more motivated to win tomorrow. Motivation is only one of the many effective methods used in predicting the outcome of a baseball game. 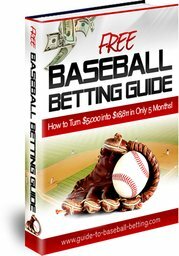 The fact that humans and computers can predict the outcomes of baseball games with reasonable success is what makes the Labouchere System ideal for enhancing your profitability and getting back your losses as quickly as possible. Click here to see examples of Labouchere versus Flat Bets. It may surprise you!